The definition of a legume is a pod or pea plant, or the seed of such a plant. An example of a legume is a bean. "legume." YourDictionary, n.d. Web. 22 April 2019. <https://www.yourdictionary.com/LEGUME>. A plant of the pea family. a. A pod of such a plant, which splits into two valves with the seeds attached to one edge of the valves. b. Such a pod or seed used as food. Peas, beans, and lentils are legumes. Any of a large number of eudicot plants belonging to the family Fabaceae (or Leguminosae). Their characteristic fruit is a seed pod. Legumes live in a symbiotic relationship with bacteria in structures called nodules on their roots. These bacteria are able to take nitrogen from the air, which is in a form that plants cannot use, and convert it into compounds that the plants can use. Many legumes are widely cultivated for food, as fodder for livestock, and as a means of improving the nitrogen content of soils. 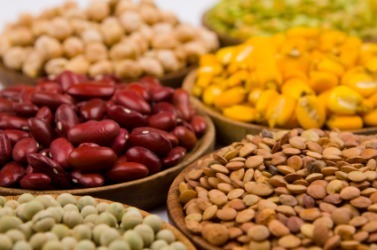 Beans, peas, clover, alfalfa, locust trees, and acacia trees are all legumes. The seed pod of such a plant. The fruit or seed of leguminous plants (as peas or beans) used for food. Any of a large family (Leguminosae syn. Fabaceae) of dicotyledonous herbs, shrubs, and trees having fruits that are legumes or loments, bearing nodules on the roots that contain nitrogen-fixing bacteria, and including important food and forage plants (as peas, beans, or clovers). From French lÃ©gume, from Latin legÅ«men (“bean"). Treat legume seeds, such as peas and beans, with an innoculant before planting. Most plants from the legume family have the ability to "fix" nitrogen, making them perfect choices for companion planting. The peanut isn't actually a nut - it is a legume. The pod (legume) of the Pea. - Lomentun or lomentaceous legume of a species of Desmodium.